The first post of 2014 is dedicated to the third and final part of my review of the "Fashion Rules" exhibition currently on at Kensington Palace in London. Here you can have a look back at the first and second part of the series (dedicated respectively to the Queen's and Princess Margaret's dresses). Today we'll take a look at the most recent dresses on show, those belonging to the late Diana, Princess of Wales. There aren't very many of them on show, just five, compared to the number of those worn by the Queen and Princess Margaret, by they make up a rather fascinating end to the exhibition, nonetheless. The round case where the gowns are put on display. Dress #1, one of my personal all-time favourites among the Princess's gowns, an evening dress of silk chiffon and satin with beaded trimming created by Zandra Rhodes in 1985 to be worn on the official visit to Japan the Princess undertook the following year with the Prince of Wales. The dress pays homage to the host country (as is customary when planning royal wardrobes) in its colour, a soft shimmery powder pink, reminiscent of the colour of cherry blossom, in flower at the time of the royal visit. 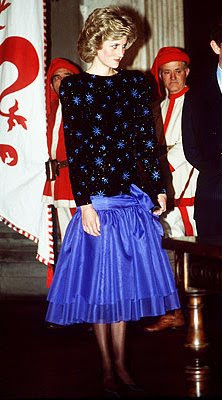 Princess Diana is seen below wearing it at a State banquet in Kyoto. Evening dress of scarlet silk with beaded embroidery by Bruce Oldfield, 1986. First worn on the royal tour of Saudi Arabia the same year. Dance dress of synthetic velvet embellished with sequins and glass beads, by Jacques Azagury, 1985, worn by the Princess to attend a dinner given by the Mayor of Florance during a visit to Italy in the same year, as seen below. The dress was among those auctioned by Christies, New York, in 1997 and was bought by People magazine, which lent it for the exhibition. 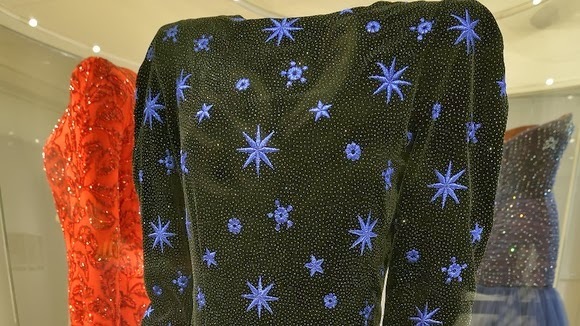 A detail of the bodice (photo itv). Strapless evening dress of midnight blue silk tulle decorated with diamanté stars, by fashion designer Murray Arbeid (who specilized in evening gowns - "he didn't do clothes that had to get up, go out and earn a living before the cocktail hour, according to Veronica Horwell of The Guardian - I just love that phrase! ), 1986. The final Diana gown in the exhibition is probably one of the most recent acquisitions of the Royal Ceremonial Dress collection at Kensington Palace and is the one you can see centre right in the photo above. A pink sequinned ivory crepe gown with asymmetric neckline, by Catherine Walker, 1991. 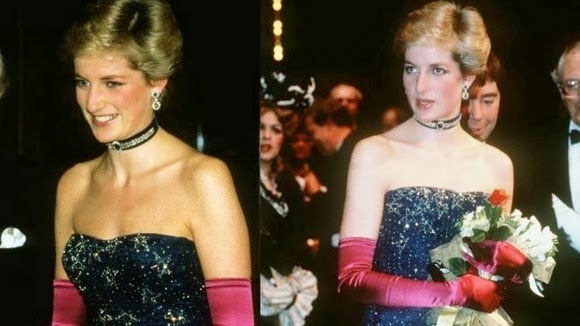 It was acquired, among others, by the museum at the March 2013 auction of Princess Diana dresses. Above, the Princess is seen wearing it on an official visit to Brazil (photo Vogue). So, what did you think of this array of fabulous dresses?